COLUMBIA, Mo 12/17/15 (Op Ed) -- For reasons I do not understand, I have a copy of LIFE Magazine from April, 1982. Its cover photo -- a handgun, pointing at the viewer -- gave me pause to reflect, on the three-year anniversary of the Sandy Hook Elementary School shootings this week; and the San Bernardino, Calif. shootings earlier this month. In end-of-the-world font, a caption beside the handgun of LIFE reads, Guns are out of control. The story to which it refers focuses on the pros and cons of an aging argument: gun -- or rather, "weapon" control -- with old arguers, too. On the pro-gun side, the National Rifle Association, 33 years ago, was asserting violations of the 2nd Amendment of the US Constitution in an argument with City Council members from Morton Grove and East St. Louis, Illinois. These Town Councils had passed a measure to ban handgun (and only handgun) sales within city limits. Called out by the NRA and other opponents as “Communists”, “Nazis”, “filthy, vile” and “lower than snakes”, Council members insisted their intent was not to violate the Constitution, but to reduce the number of homicides by gun. The ONLY purpose of handguns was to kill people, the Council members asserted. Handguns are not for hunting, but homicide. Today, the gun lobby has upped the ante. With the political muscle big donations and lots of lobbyists have built, the NRA has conflated long guns – rifles, shotguns – with handguns and semi-automatic machine guns. It has staked positions in opposition to even the simplest weapons control measures: background checks that screen out crooks and the mentally deranged, for instance; or limits on the number of bullets in a magazine. Some hunters have poor aims, you see. They may need to shoot up to 30 times at whatever foul or animal they're gunning for. (Thirty, by the way, is about how many people guns in America kill each day). And though none of our mass shooters was planning a "well-regulated militia," the gun lobby nonetheless insists that the right to form such a Constitutionally-guaranteed thing "shall not be infringed." Gun rights, for that reason, have a special status among our Constitutional guarantees: Any infringement is considered deprivation. First Amendment free speech guarantees, on the other hand, are toned down for public safety. The US Supreme Court has ruled that shouting “fire” in a crowded theater is NOT a First Amendment right. Looking at LIFE, I think: For 33 years, gun control has been a hot topic. We've had hundreds of thousands of gun deaths since. The media is all over the periodic mass shootings, which are all over the nation. Gabby Giffords' shooting in Tucson; the Umpqua Community College massacre in Oregon; Planned Parenthood in Colorado Springs; Dylan Roof's racially-motivated killings in a Charleston, S.C. church. And nationwide, more than four gun fatalities per day. Police and first responders agonize. Parents and neighbors unite. Communities build make-shift shrines and memorials. The nation sends thoughts and prayers. The President speaks. Congress promises. Or not. What has been done? The gun violence problem has greatly worsened. 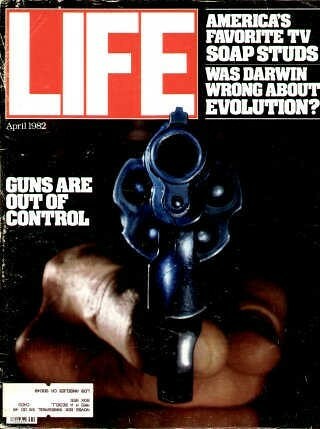 In 1982, we were dealing with handguns. Today, we're dealing with weapons of mass destruction. You are here: Home Op-Ed MIDKIFF: Where's the sanity around Americans and guns?